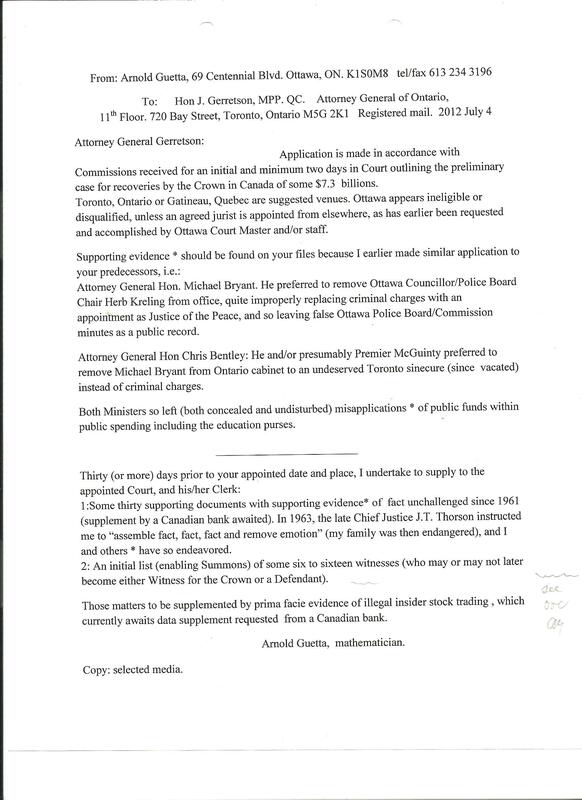 In reviewing 2012, it is first noted that the resignation of Ontario premier Dalton McGuinty (despite one’s permanent optimism for the petitioned open due process) predictably followed my registered letter of July 4 to Ontario Attorney General J. Gerretson (reproduced below) of which I have received no acknowledgment. Silence when charged is generally an admission of recorded fact. Premier McGuinty’s removal of Ontario Attorneys General Chris Bentley and Michael Bryant is recorded, just as Michael Bryant had removed Ottawa Councillor/Police Board Chair Herb Kreling, thus concealing disclosed thefts from and abuses of various public purses in Ontario. A half-century of continuous related Ontario evasion of judicial process and exposure of illegal delinquencies is recorded, from the replacement of Tom Harvie, Chief Engineer, Canadair Ltd and contemporary Chief of Defence Staff W. Bean in the ‘Sixties, through cabinet ministers and judges as is documented with evidence and references elsewhere in this site. The hazards of this work to mathematicians and associates in Ottawa Centre, including violent death, are exceptional . RIP: Dr. F. Hobson, John Kroeker, P.Tyas et al. I have recently been able to reimburse Teri Massia, who worked without pay for some months, after supporting ministers and public servants left public office. The exceptional support of journalists Barry Conway (CPAC), Paul Russell and Jesse Kline of the National Post (and others prudently anonymous) is also both vital and appreciated. The recovery of $7.3 billions Cdn/5 billions Pounds Sterling from delinquents, the annual saving of $26 billionsCdn/17billions Pounds Sterling by closing the corrupt and the useless, and the relief of the public debt of all Ontario residents of some $50,000 per capita remain urgent motivation for this and related work.